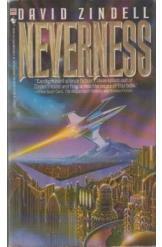 Neverness by David Zindell, Sci Fi. Book is in good condition, all pages intact. In a sprawling universe of genetically engineered humanoids and moon-sized biomechanical computers, pilot Mallory Ringess returns to the planet Neverness with new information. The ancient Ieldra who seeded the galaxy with their DNA and their technology possess the secret of immortality, and Mallory plans to lead an expedition to recover it.